This week I have three vigorous, healthy hens. Only one is giving me eggs, but these are only year-old birds, and I know that as the days lengthen, their egg-laying hormones will switch on and omelette time will be with us again. But last week I was ready to dig a big hole and bury all three of them. One was mysteriously sick, one was obsessively plucking the sick one's head, and the other was just coming out of a severe moult. I had been away from home for weeks, and they had lacked the extra TLC I usually give them over winter. There were even a couple of days when their Grandpa's Feeder was empty. Woops. After my return home, I spent a sunny few hours weeding the vegetable garden and tossing the weeds into their run. It was paradise for them, as they nibbled and pecked and scratched! I love their happy, busy sounds at such times. A common foxglove plant in winter. They like to grow in sunny spots. The next day, I noticed one of the girls was sitting still and hunched. At one point she moved quickly to get some chickweed I threw them, and she stumbled and fell. - her vent - but it was pale pink and clean. - her throat area - but it was not fluid-filled, and no liquid came out of her when I tipped her upside down. - her legs and feet - were they red, swollen or broken? Nope. I did notice she had a bald patch on her head. The exposed skin was perfectly clean and undamaged. On day 4 she looked so miserable that I decided I had to put her out of her misery. She was skinny and still. Her feathers were fluffed up and her tail pointed towards the ground. Her comb, however, was very red and pert, which confused me. At the last minute I decided to check with Dr Google about sick chickens with no other symptoms. There it was: digitalis poisoning. I had known foxglove contains digitalis, from which the heart drug digoxin is made (or modelled on these days, possibly). But throwing foxglove into the coop? This apparently used a completely different part of my brain. Doh. Digitalis alters heart muscle contractions, in a way that can help if you are a human with heart failure or an ineffective heart rhythm, but in a way that is very unhelpful in the wrong dose to a creature or person with a normal heart. I had poisoned my hen. Fortunately, one helpful message board said that it would take a few days to clear her system, and that she should be separated from the others and kept warm. Each night I brought her inside, sitting her in our roadside recycling bin lined with barley straw. I covered the bin with an old woollen jumper with the corner folded back to provide an air hole. This cover made it dark for her, and therefore kept her calm (she wasn't well enough to jump out, but I didn't want to frighten her). I sat her just inside our back door, because although beside the fire in the lounge is warmer, I decided she wasn't used to such temperatures and it might be too hot for her. During the day I put her in a pen next to her friends to keep her happy. Sometimes sick birds need to be completely separated, but her illness wasn't contagious, and hens like their friends. She had food and water on offer, but barely touched it. She got skinnier and skinnier. After a week I noticed she was eating a bit and producing a bit more poo. Next day, I took her outside in the morning, and before I put her down I offered her some of her regular pellets from my hand. She was hungry, and ate! Then things went wrong. Her head twisted to one side, and soon she started twitching. I put her on the ground and she lay on her back spasming. Her eyes were closed. I was sure she was dying in front of me. Oddly, my brain kept working calmly. She had been getting better - she was hungry - she ate a solid pellet. Could she be choking? I picked her up and held her upside down, head first, gently rocking her repeatedly downwards. She stopped spasming and became very still. Sadly, I laid her down on her patch of dry barley straw. Her eyes were closed and her head and beak lay flopped on the ground. Then I noticed she was breathing hard. She took huge, laboured breaths as if she had suffocated and was recovering. I think she had been choking, and it had cleared. A few hours later she was wandering around, tail perky, pecking at things as if nothing had happened! There is nothing wrong with me now. Today, she is wildly healthy, and I suspect it's her giving me the daily egg. Her head feathers are growing back. That was another mystery I solved - she had been at the mercy of her flockmate's beak - but I'll save that for another post! Have you dealt with digitalis or other accidental poisoning before? Does foxglove grow in your garden? When it's flowering, which is in summer, it looks like the image below. Bumblebees love it, and I think it's beautiful. But it's also terrible. Thanks to TERRAIN.net for this image. They have more photos, and good close-ups of the leaves: click here for their full report. Thanks for the info, I have 4 chooks all good layers. You got to know these things. 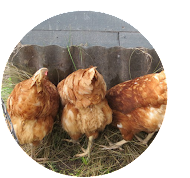 Join us in this place of fresh ideas and inspiration to make keeping chickens easier, more fun and better for your birds.